April 1, 2011 By Lisa Sharp Leave a Comment As an Amazon Associate I earn from qualifying purchases. This post may contain other affiliate links I earn from as well.Click here for full disclosure. Karen Miles at the first clean-up. 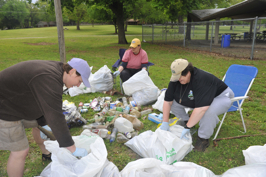 Six years ago Karen Miles heard about LitterBlitz – an event in Oklahoma that encourages people to clean up their neighborhoods – and wanted to get involved. She enjoys walking her dogs around Lake Overholser and the Stinchcomb Wildlife Refuge so she decided that is the area she wanted to clean up. She knew she couldn’t clean up the area’s alone so she started asking others to come help. She also asked local businesses to donate items to giveaway to those who came to help. She finds this to be an added encouragement for people. The first year she had around 12 people and each year it has grown, last year the count was 125. In addition to the increase of people participating each year, there has been a decrease in the amount of waste they find. This is a very positive trend that Karen and other participates hope to keep seeing. 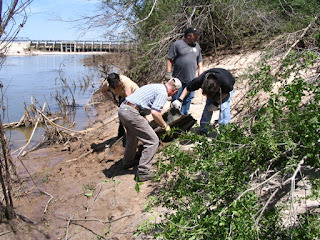 Volunteers digging out a piece of metal on the North Canadian River. Karen says the first year she wasn’t very well prepared. She now plans the event in advance for the month of April, which is also the Great American Clean-Up. 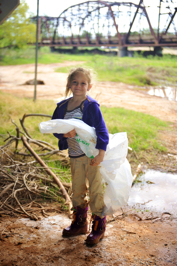 She is able to get supplies through organizations like Oklahoma City Beautiful and Keep Oklahoma Beautiful. She even has national sponsors that have helped like Waste Management and Pepsi. Last year Boulder Chips sent chips and t-shirts for the participates. Karen hopes to continue to see this grow but says she needs help. Sorting out recyclables, it’s important to Karen that as much as possible is kept out of the landfill. Oklahoma needs more people like Karen that not only care about the areas around them but take action to protect them. 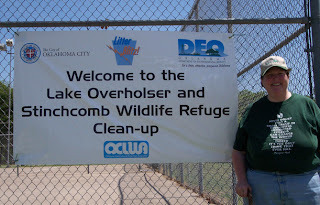 There are many ways to help this great state of ours and one is to help Karen and her clean-up of Lake Overholser and the Stinchcomb Wildlife Refuge. To find out how you can get involved please click here. The upcoming LitterBlitz – the event that motivated Karen – is also coming up, click here for more. Lisa Sharp is passionate about green living, organic food, animals, and natural medicine. She is an environmental activist, green living expert, and consultant. In addition to being the founder and editor of Green Oklahoma, Lisa has a green living blog, Retro Housewife Goes Green. You can follow Lisa on twitter @Retrohousewife5 and Facebook. Is Your Pumpkin Spice Latte Ruining the Planet?